A note from the desk of... You fill in the blank. We all have a different idea of what name fills that spot. From the desk of the President. From the desk of Mr. Patterson. From the desk of Josh's Mom. Custom notepads have been around for a long time. Gone are the days of boring notebook paper. Say a big "hay" to a splash of extraordinary. 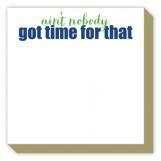 Order custom notepads for all the people you care the most about. The people that deserve something extra special. 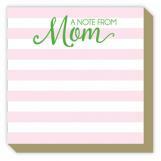 Think about creating a notepad for the Dad or Mom in your life. It is so fun to pull out your notepad to jot down your to-do list and see your child's face. There is something about it that makes getting sh*t done a little bit easier. Maybe you need the perfect Teacher Gift. Teachers deserve cute and fun gifts, that is for sure. They spend all day with our kids. Imagine the added pep in their step when they reach for their notepad. You can create one just for them. We have pads with yellows and purples and plaid! Oh my! Say adios to boring paper. Then say hello to breathtaking gifts splashed with personalization. We have bold reds, soft pinks, and vibrant oranges. Order your choice today! With so many colors available, you are sure to find one that matches the occasion. Don't forget, you need to order a notepad for yourself. Choose a calendar pad to keep your week organized. 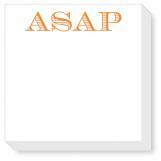 Our online notepad printing services give you pristine quality. The notepads are set with prices you can afford. You not only get something that people will look forward to using - you get the peace of mind of great quality printing that is easy on your budget. Notepad printing creates a moment that is recreated over and over again. 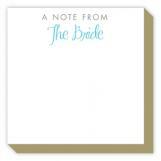 Hand out printed notepads at your next baby shower, birthday party or special event, and make them part of your party package. Include your mantra, perhaps a tagline or an inspirational message that captures your mission. Let people be reminded of your event. With every printed page you have an opportunity to stay top of mind and reinforce your brand. As family and friends use your notepad to jot down phone messages or make notes, they will think of you. 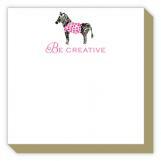 Our notepad printing is offered in a variety of sizes, printed on 70# bright white paper with a heavy card stock backer. We design full-color notepads with 50 pages per pad. 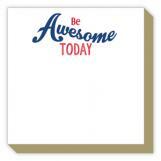 Add a personal touch to your desk with stylish and convenient personalized notepad. Ruled lines are available, just ask. Optional design features are available. You can even create one-of-a-kind notepads by using our design center. Choose from our variety of pads. Add a photo if you want to tug at the heartstrings. For the soon to be bride and groom, create a notepad with their new monogram. You can make a honey-do-list just for the groom. Maybe you want to make a Sonny-do-list for Mom so she doesn't feel so bad asking the son in her life to check her oil for her. She can just add it the list. It is all about making a mark with thoughtful gifts. Kindness is easy and it doesn't cost any extra. Note to self - spread the love.